I believe today's action was constructive. There was a lot of put buying today and yet the market has managed to hold itself together. 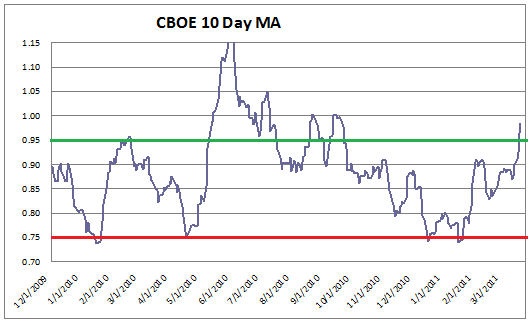 I have not yet updated the chart below for today's put/call ratio but today's action takes it up to the 1.00 level. I remain constructive through April and believe dips are for buying. Have a great weekend. 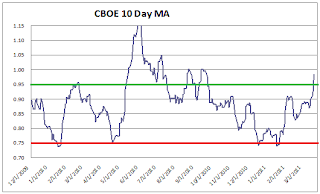 *I would also note that the only time this entire bull market that CBOE put/call ratio exceeded 1.00 was this Summer after the Flash Crash and Persian Gulf Oil Spill . The previous time was in January 2009, during the bear market. ** I know many readers prefer the equity only reading. We are also at an extreme on that indicator as well. Load of people bot in Feb and March and are now sitting on losing positions. Margin clerks should remain busy remainder of month imho.